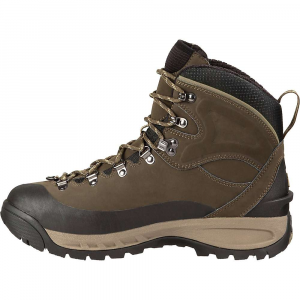 A lightweight, comfortable hiker, Keen Voyageurs are great for multi-day backpacking and day hikes on all terrain. The tread is fine for steep grades and wet rock. I only wish they wore out a little less quickly — I'd love to have a boot last five years, but maybe that's just wishful thinking! Don't expect them to keep water out — low vents let in shallow puddles. My Keen Voyageurs have served me well for four years. I love that the toe box is exceptionally roomy and yet the lacing systems locks my mid-foot and heel in securely. The boots are also light and breath well with the many side vents. With years of fairly regular use the soles will break down, with the black outer sole starting to come off in chunks and the grey inner sole scraping off. I also noticed that the boot rim at the heel wore out relatively quickly. Overall they are decent boots, to be worn into the ground — don't expect them to last forever. Thanks for sharing your hiking boot review, Becky. Welcome to Trailspace! I have almost bought Keens several times, thanks of the review. Wearing boots out is a good thing, keep rolling off the miles. Lightweight, not waterproof, soles separate. 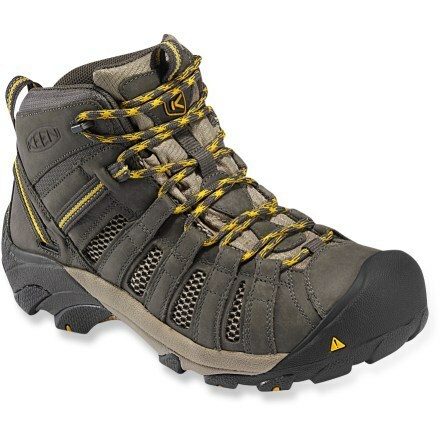 After ditching Merrell because they turned to very poor quality, I switched to Keen. For the price (I got it for much less than $125 and new) this is a decent lightweight shoe. One should have no expectations about them being waterproof; I knew this going in, so no problem there. However, I've spent a lot of time gluing the soles together, as they simply separate. Not the whole thing but substantial parts where the black tread protrudes from the overall sole. Perhaps if the protrusions were less pronounced they'd not suffer from this defect. But still, other parts come apart as well. Despite the time spent gluing, this will be less of a hassle than sending them back, because I need to go hiking—now. Besides this being a major, correctable defect, these shoes take a beating and while they shouldn't come apart at all, given their lightweight, breathable composition, still a passable deal. The Durands I have are more durable—we'll see how that goes going forward. Welcome to Trailspace, TBone! Too bad about the boots coming apart, but thanks for sharing your experience with them. If you have some pics to show others in your review, that would be great. I have worn these hiking boots for three years, last me long time. 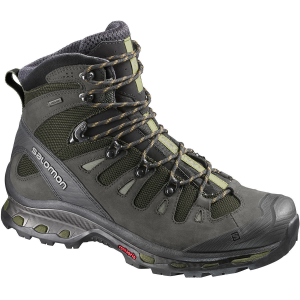 Comfortable waterproof, light, easy to hiking. I still loved these hiking boots. It was worth the money, expensive yes! Till 3 years worn out! Excellent hiking boots and had worn them for three years and now worn out, can't use it anymore. I will definitely buy similar product again. It fits me so comfortably, cool inside, dry very quickly, no pressure or chaffing at all. When I'm hiking in my boots I can feel the sole underneath me that gives me comfort to balance along the rocks, hills, so forth not even bend my ankle at all. I did put my hiking boots In the creek water to soak it wet. No water comes in my boots! Wow it feels so cool after I step on the creek. Then it dries fast! Loved these boots, still miss it! The Keen Voyager Mid is my all-time favorite boot to wear for canoeing and portaging in the Boundary Waters (Minnesota) and Quetico (Ontario). I load and unload my canoe in the water to protect it from wear and tear, and I haul big loads (a canoe plus a 40-50 lb. pack) over very rugged terrain (jagged rocks, steep and crumbly slopes, hip-deep mud) with soaking wet feet. I need something that will protect and support my feet and ankles, then dry out quickly once I make camp. 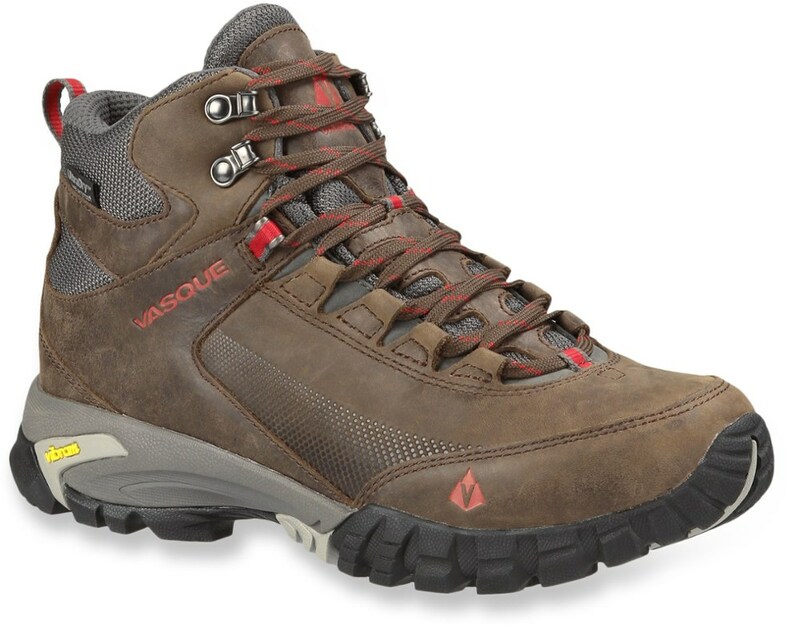 The Voyageur delivers all this performance with an outstanding level of comfort. I used to buy inexpensive light-hikers, and I usually trashed them after one or two trips. The Voyagers have survived three long trips (7-10 days) getting soaked every day and drying out every night, and they still perform beautifully and show little sign of wear (I only wear them on canoe trips). They are the most comfortable and quickest-drying hiking boot I have ever found. As long as they fit the shape of your foot, I think they are ideal for wilderness canoeing. I started canoeing in the BWCA and Quetico in 1983, and I have taken fourteen trips to the area, ranging from solos to groups of eight, and from four to fifteen days. Back in the early to mid 90s, I worked part-time in outdoor gear stores (Burger Brothers, REI) and sold boots, but I never had any experience with Keen products until buying sandals in 2007 and the Voyagers in 2008. 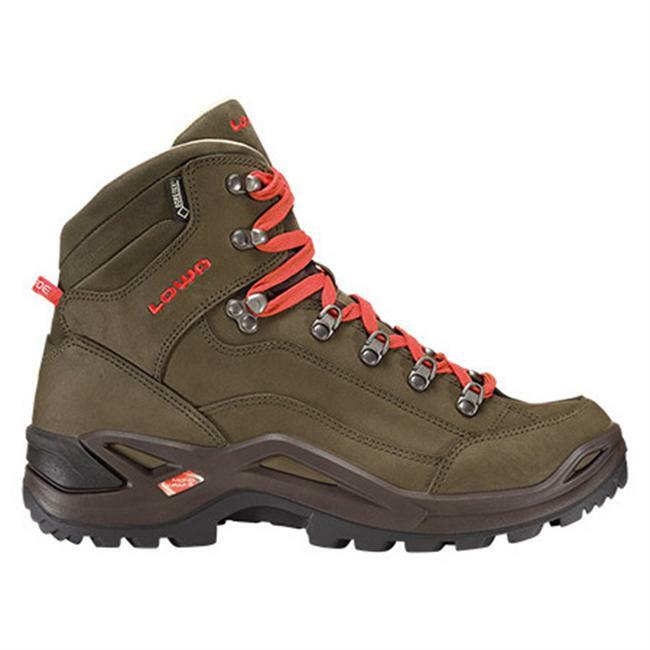 This boot is not for those hiking in wet terrain nor on rainy days. It is VERY well ventilated and water pours in. The grip in wet conditions is poor. Given that, for dry areas in hot weather it is great. It required almost no breaking in for a 26.2 mile march through desert, up rocky slopes and through moderately deep sand near Las Cruces, NM. The ventilation is great and the wide toe box fits my 'duck' feet perfectly. In other stiffer boots the bottoms of my feet feel beaten up after 10 or 12 miles in the mountains - not in the Keen's - but I don't take them to the mountains - only in the low deserts. I might consider adding a thin gel insole for a bit of extra cushion over rocks - there is not a lot of protection except for the toe protector which is great. A hiking partner had Keens as well but her sole was starting to separate from the uppers. A good dose of Gorilla Glue fixed them fine though ugly. Do not take them into wet areas - you'll be sorry. Do take them into hot, dry areas - you'll be happy. A note to the manufacturer - the top 'snap' device for the shoelaces is annoying and a friend had one break the first week he had them. The laces require a bit of tugging to get them unsnapped and, when you're tired, hot and sweaty and want to get the boots off it becomes really annoying - better to have a hole or a roller there - not a plastic clip. When trying on several models and brands at the store recently, the Keen Voyageur Mid provided a far superior fit to all the other models. 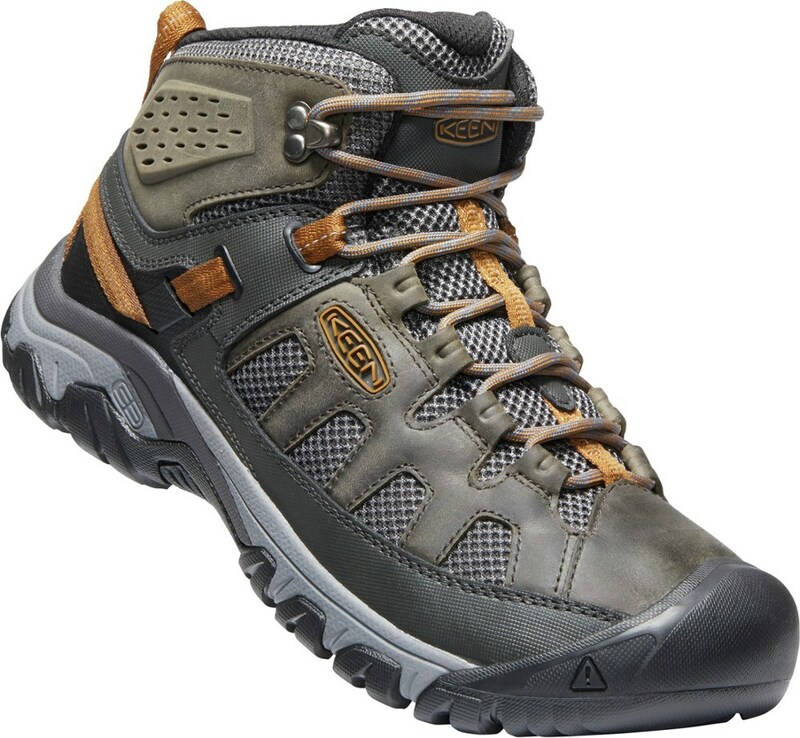 I bought the shoes for general day hiking and light overnights. I wore them on a 6 mile backpacking trip recently. The terrain was moderate to hilly woodland and there was 25% off trail hiking and exploring carrying a 22lb pack. The first thing I noticed was that I did not notice them on my feet while walking in from the Trail Head. That is to say they were so comfortable that I did not feel them. The cushion in the footbed is extraordinarily comfortable, however I could tell that the shoe was at its limit with my pack weight. The shoes provided good traction and security on some fairly steep off trail downhilling in woodland terrain. One other point to note is this shoe is not waterproof and is probably best suited to warm dry weather when hiking. Use: Steep ascents with 40+lbs pack. This boot is my first "real" hiking shoe and I love it. 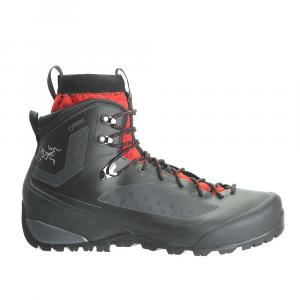 It is comparably lightweight to other comparably featured boots and its mesh panels provide awesome ventilation. The toe is heavily rubberized and kicking into rocks on my last steep hike was worry free. These boots fit pretty true to size or maybe a 1/4 size bigger, but that allows room for a footbed and sock space. I also noticed that my toes did NOT crash into the front of the book on steep downhill descents and that was awesome. Great boot, great price. I'm sticking with Keen from here on out.